One of the challenges in tablescaping which I probably enjoy the most is in implementing elements ranging from very inexpensive (some, in fact, free) to higher end items, but having guests seeing no more than a welcoming table. In my trademark fashion, I also love styling my tables with something old and something new. As an antique dealer I'm probably biased, but it's usually the something old that gives the table its character, in my opinion. It's also a lot of fun to utilize items for purposes other than their original, intended use. 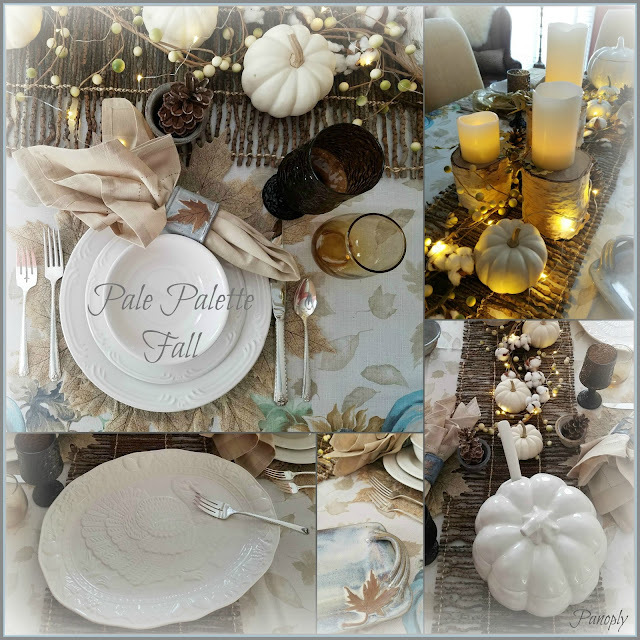 Today I'm sharing a pale palette fall tablescape with Thanksgiving in mind, using elements of various price points, in the hopes of demonstrating how a cohesive look can be achieved with a little creativity, but not necessarily with a big budget. A source list is provided near the end of this post. For even more Thanksgiving/Autumn table inspiration, check out all the blogs listed at the end of this post as part of an ongoing tablescape blog hop, hosted by Chloe from Celebrate and Decorate. I started my tablescape by using a mostly cream tablecloth, with a border of pumpkins, gourds, sunflowers, and oak leaves in muted colors of browns, greens and blues. Although the border is what caught my eye, I did not want it to overwhelm the look on the table. I grounded it by layering twig placemats as a runner down the table's center. 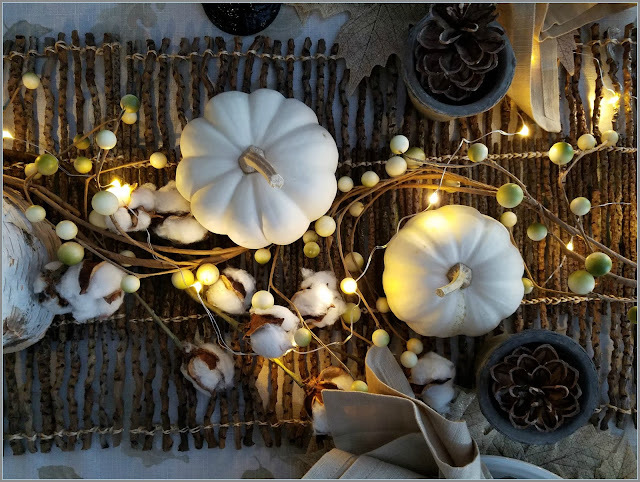 Baby boo pumpkins from the farmers' market are nestled among cotton boll stems and berry garland, with a string of tiny lights casting a soft glow. Each place setting is marked with a clay peat pot in gray, and a pine cone in each to hold the name card. 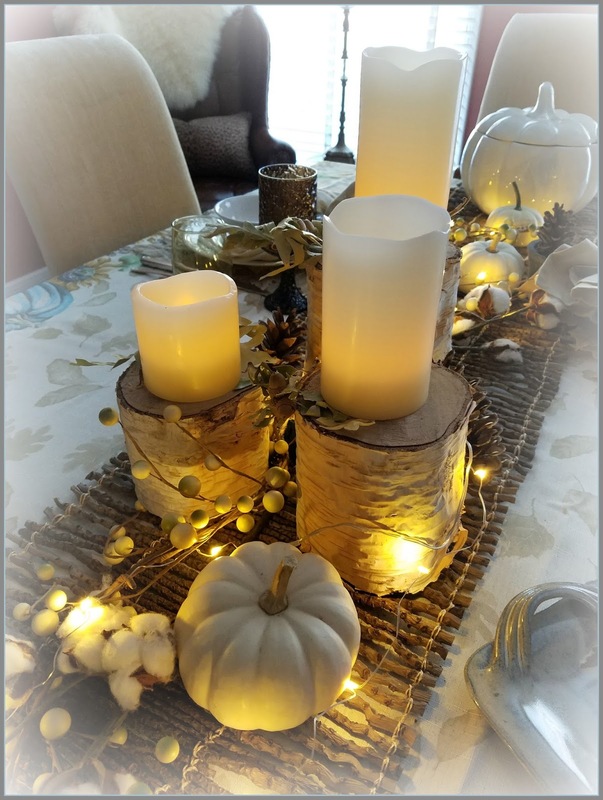 The centerpiece consists of graduated, white birch logs (from a fallen landscape tree) used as pedestals for graduated candle pillars (battery-operated). Gathered oak leaves and acorns from the outdoors are scattered on the table. 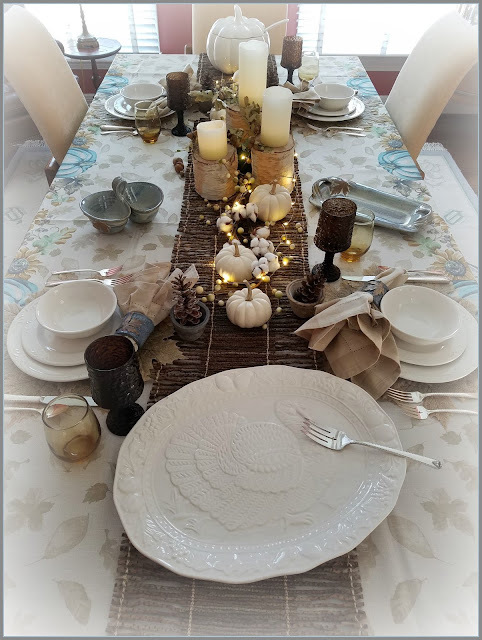 The turkey platter and flatware are estate finds, while the glassware hails from each of Mr. P.'s and my former (and separate) housekeeping days. The ceramic pieces with applied maple leaf - bread tray, double condiment caddy, and napkin rings - are hand-thrown pottery by a local artisan. Napkins and placemats are new this year, while the pumpkin tureen was sourced a couple years ago. 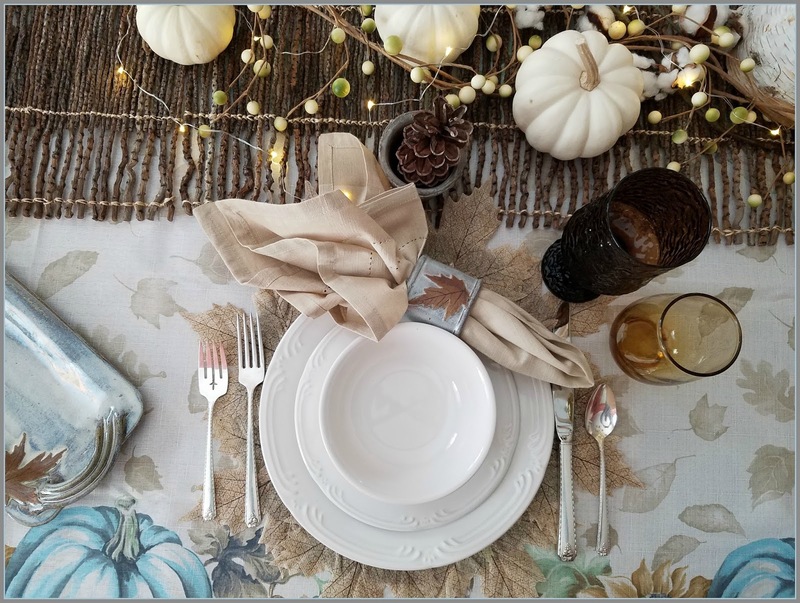 The cream dinnerware is stacked on a natural colored, leaf placemat as its base. 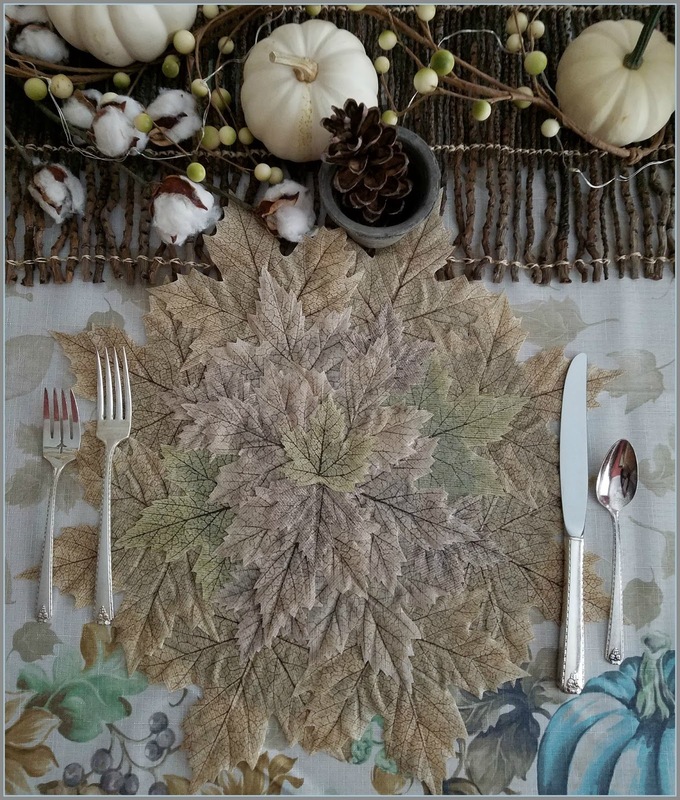 This tablescape uses the leaf motif as the common thread among the various elements. The overall look is soft, neutral, and natural, leaning easily toward a coastal, cottage or farmhouse style. Although none of those styles are really what I have in my home, I like them all. What kinds of elements will you (or your host) be using this season? Will you mix and match high and low, old and new, and/or use things for purposes other than originally intended? Or, are you a purist of one kind or another? What's your style? I hope you leave a little inspired to challenge yourself to being creative this holiday season. Feel free to pin any ideas you ever find here on my blog that serve that purpose for you. 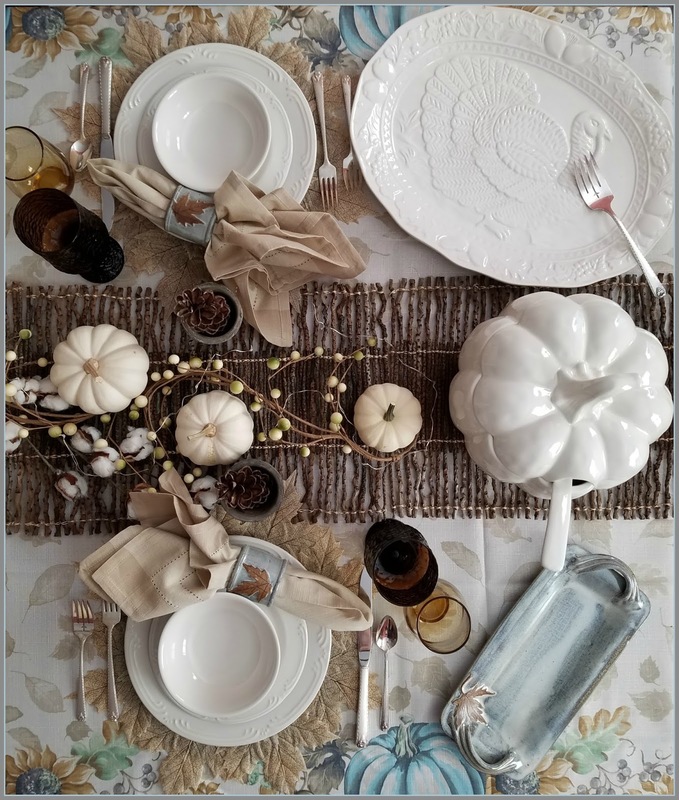 There are many tablescapes for all the seasons you can check out, including this personal favorite from last week. You can also see a 'Tablescapes' category from the main menu (if on a mobile device, scroll to the bottom and click on "view web version" first. Search for a particular season by typing in keywords (such as 'fall tablescape') in the search button on the sidebar, or scroll through my labels, also on the sidebar. A sincere thanks goes to Chloe, from the blog Celebrate and Decorate. 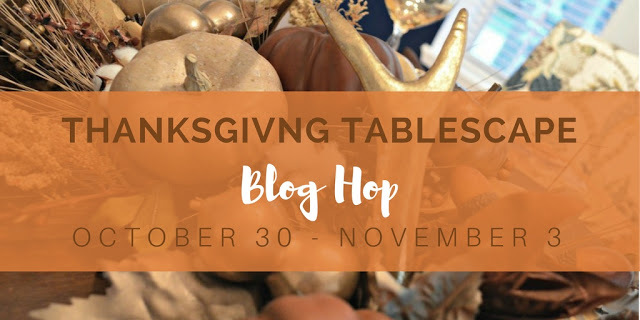 She is our organizer for this gathering of bloggers who are sharing their individual Thanksgiving table ideas. 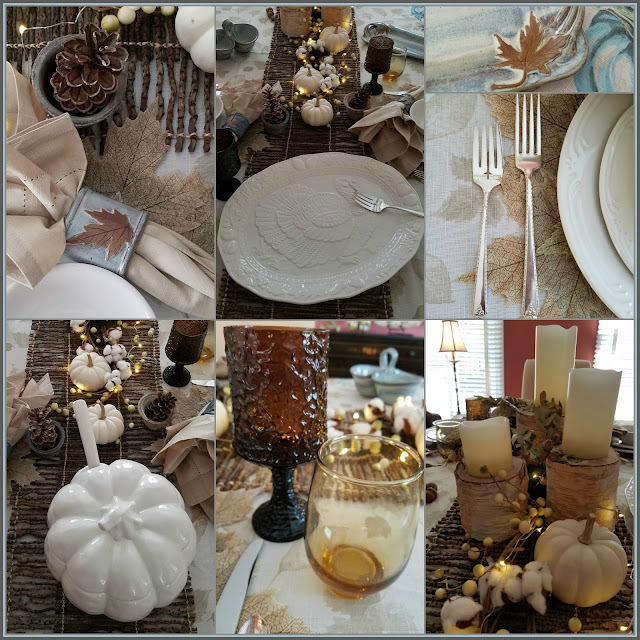 Click on each of the links below for the landing pages of each of the participating blogs to see a true feast of Thanksgiving/Autumn tablescape ideas! Thank you for your visit today. Your readership and comments are always welcome, and I invite you to return again. If you'd like, you may sign up (on my sidebar, just below my profile pic) so my posts will come to your email inbox. That way you'll be sure and not miss a thing. Enjoy your holiday planning!